This year’s fabulous catwalk will present the “Resort 2017” collection created exclusively for the hotel by renowned designer, Raquel Orozco. 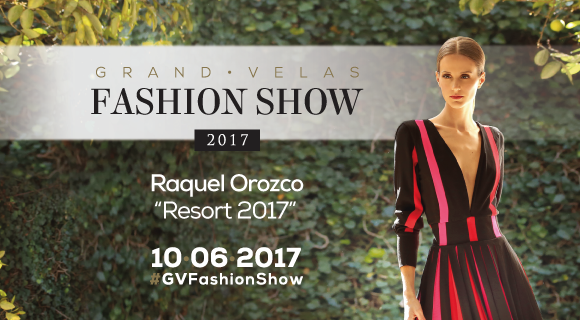 The Grand Velas Riviera Nayarit is all set for the III Grand Velas Fashion Show (GVFS) to be held next Saturday June 10, 2017 at 8 p.m. sharp at this beautiful Nuevo Vallarta property. “Fashion and luxury are two essential elements in the Riviera Nayarit. This event is undoubtedly right on target to promote the destination, which is why we love it and are happy to be a part of it,” said Marc Murphy, Managing Director of the Riviera Nayarit Convention and Visitors Bureau. The cutting edge fashion and design event is taking place for the third consecutive year in the destination. This year the runway will feature the “Resort 2017” collection created exclusively for the hotel by renowned designer Raquel Orozco. The Raquel Orozco brand was born in 2008, when the multifaceted designer was seeking t something different, unique for her, based on her cosmopolitan style and her love of fashion. Her forward-looking style has led her to create innovative projects including the presentation of her collection via a “Fashion Film,” which was chosen as one of top 10 on the international platform A Shaded View on Fashion Film (ASVOFF). The hotel is offering a special rate of US$340 per person, per night, for those staying from June 9-12, 2017 during the GVFS; it includes a US$50 Spa credit and a 10% discount at the boutique. Access to the fashion show is free and by reservation only; call 01 (322) 226 80 45 or write conciergern@velasresort.com to reserve. For more details visit: http://gvfashionshow.velasresorts.com/es/.